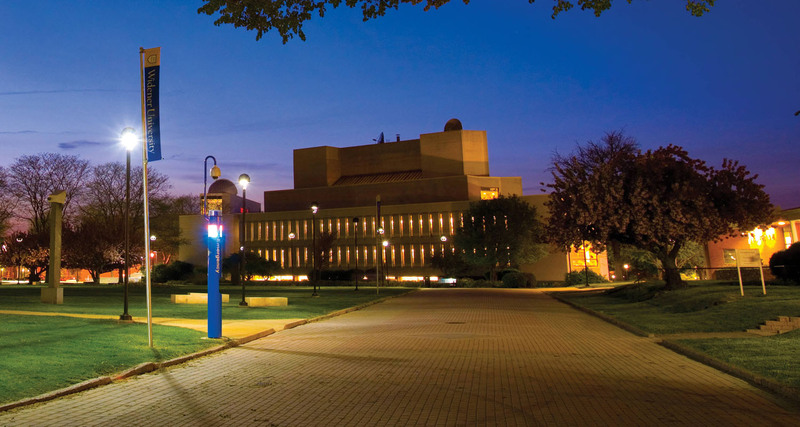 The PACSCL Board of Directors recently accepted the membership application of the Wolfgram Memorial Library of Widener University, welcoming the organization as its fortieth member. 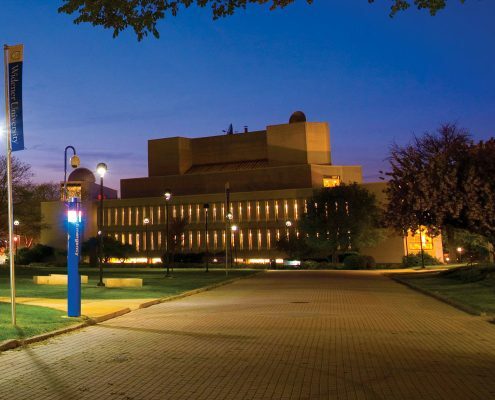 “The Philadelphia area enjoys the intellectual and economic contributions of a robust higher-education sector, and the records held at Widener University’s library will add an important new dimension to the history of education in our region,” said Ronald Brashear, chair of the PACSCL board. Charles Hyatt’s Funeral Procession, 1930. Legend tells us that college photographer Arthur V. Knott takes a picture of cadets training with cannons and fixed bayonets but fails to develop the film. Later, when Gen. Hyatt dies, Knott photographs the caisson bearing the general’s body using the same film. The resulting double exposure creates the effect of cadets guarding the casket of their former president. Widener University Archives. Adds Jill Borin, University Archivist and PACSCL member representative, “Our archives collect, preserve and share print and digital materials — papers, photographs, scrapbooks, student newspapers, audiovisual items, and memorabilia. These materials relate both to Widener University and its predecessor institutions. Our digital collections, now with nearly 10,000 items, include the history of Widener and its predecessors, as well as the history of Chester, Pennsylvania.” These digital items can be found at http://digitalwolfgram.widener.edu/digital/ . The library utilizes OCLC’s CONTENTdm for digital collections and ANDORNOT’s InMagic database. It collaborates with Widener’s Pennsylvania Military College (PMC) Museum on campus on library-museum projects and initiatives. 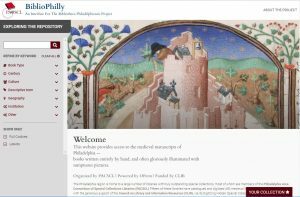 BiblioPhilly news: new interface now online! The new interface to PACSCL’s online archive of manuscripts. Click the image to reach the site. NOTICE: THE UNDERLYING INTERFACE WILL BE OFFLINE DECEMBER 26-JANUARY 1. Some metadata on the interface may be searchable, but the images will not be available. Researchers are recommended to download manuscript images prior to December 26. Instructions for downloading bulk images are here. Bibliotheca Philadelphiensis is proud to announce the new interface to the hundreds of manuscripts now online. Click the image to the right to reach the site. Launched during the Penn Libraries’ eleventh annual Lawrence J. Schoenberg Symposium on Manuscript Studies in the Digital Age (November 15-17, 2018), the new interface offers faceted searching (by book type, century, holding institution, and more), a page-turning interface, collation diagrams, download capabilities, and more. New manuscripts are being added regularly. When the project is completed, in spring 2019, it will include approximately 475 manuscripts and 1,000 leaves. The project was organized by the Free Library of Philadelphia, Lehigh University, and the Penn Libraries and involves a total of sixteen institutions. The Bibliotheca Philadelphiensis project, which involves sixteen PACSCL partners, has been funded by a generous grant from the Digitizing Hidden Special Collections and Archives initiative of the Council for Library and Information Resources. https://pacscl.org/wp-content/uploads/2018/11/new_interface.jpg 813 1241 Laura Blanchard http://pacscl.org/wp-content/uploads/2018/09/pacscl-logo_sm2.png Laura Blanchard2018-11-19 16:55:152018-12-18 16:25:26BiblioPhilly news: new interface now online! The PACSCL Board of Directors recently accepted the membership application of the John J. Wilcox, Jr. Archives of the William Way LGBT Community Center, welcoming the organization as its thirty-ninth member. “Philadelphia has been a city of firsts in the struggle for equal rights for LGBT individuals, and the John J. Wilcox, Jr. Archives has been instrumental in documenting these efforts.” observed PACSCL board chair Ronald Brashear (Science History Institute), in announcing the Board’s decision. Current PACSCL members, including the Historical Society of Pennsylvania and Temple University, also have collections that complement those of the Archives. The Archives serves a broad range of users, including the LGBT community of Philadelphia and the Delaware Valley, scholars/researchers from around the world, activists and artists, students from area K-12 schools, undergraduate and graduate students, teachers at area schools, local history researchers, journalists, writers, and documentarians, and William Way LGBT Community Center staff. Topics represented in the collections include LGBT history and culture, generally; LGBT history in the City of Philadelphia and the Delaware Valley, specifically; the homophile and early LGBT rights movements; feminism and feminist organizations; and HIV/AIDS and its impact on the local LGBT community. The primary formats collected include manuscripts, printed texts, photographs, graphics, artifacts and objects, textiles, audiovisual materials, artworks, and born-digital materials. The time period of the collection ranges from the 1920s to present, with heaviest emphasis from the 1960s on. The collection is approximately 800 linear feet and growing. The Archives makes use of ArchivesSpace as an archival management and access system ( https://wilcoxarchives.org/) and have recently launched an Islandora-based digital repository ( https://digital.wilcoxarchives.org/). The Archives mounts between 3-4 material exhibitions each year in the Archives Gallery located in the lobby of the Center. Its online exhibit, “Speaking Out For Equality,” is based on the groundbreaking exhibit the Archives mounted at the National Constitution Center in 2014-2015 ( https://sofe.wilcoxarchives.org/). A second traveling version of “Speaking Out For Equality” was mounted in collaboration with the Independence National Historical Park at the Liberty Bell Center during the summer of 2018. The Archives are open to all by appointment during the general operating hours of the William Way LGBT Community Center ( Monday-Friday, 11 am – 10 pm; Saturday-Sunday, 12 pm – 5 pm).